This “cheese” has enabled me to take my vegan cooking to another level, creatively. I used to absolutely love goat’s cheese and that creamy, tangy textural flavor has been something I’ve truly missed. By fermenting raw cashews with probiotics this already amazing seed/nut gains new heights of culinary glory in my book. It’s also an incredibly tasty way to boost your digestive system’s probiotic population. I’d heard of the technique of using probiotics to ferment nuts, and my first attempt used a homemade rejuvelac as the probiotic source because I wanted to keep it as natural as possible. Using rejuvelac, which is obtained by soaking grain sprouts in water overnight and allowing them to ferment, worked really well and I loved the end product. The only problem was that I didn’t want to have to plan ahead for a week in order to make the fermented nut cheese. That led me to an investigation of commercially available probiotics. My requirements were pretty straightforward: It needed to be a quality product that came in a powdered form and packaged in gelatin-free capsules. After looking into myriad brands and formulations, I felt most comfortable ordering a blend from Udo’s. This recipe makes @ 2 cups of soft cheese. After it is made, you can divide it up into portions and freeze for later use. Drain the cashews and rinse. Place the cashews and water into a blender and purée until smooth. Empty the probiotic capsule into the blender. [Throw away the capsule.] Blend briefly to combine. Pour the contents into a nut milk bag that has been placed in a bowl large enough to accomodate it. Set aside and let sit out at room temperature overnight to ferment. Remove the nut cheese from the bag and place upon a piece of plastic wrap. Form into a log and roll it tightly in the plastic. Place in the refrigerator until it has chilled enough to be able to cut it into even slices. At this point it is ready to eat as is, or you could do as I did above and roll the log in some freshly chopped herbs and/or nuts prior to cutting into slices. I’ve been meaning to make a similar cheese for ages, having only made fresh cashew cheese, and using it before it had time to ferment. Your recipe sounds very do-able and delicious. Thanks! 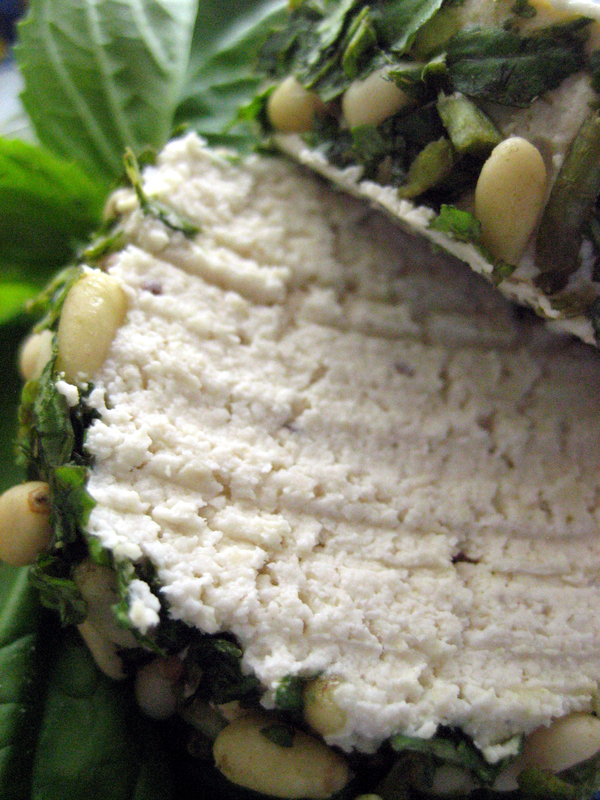 I make raw nut cheeses a lot, but fermenting takes them to a whole other level. This looks rather fool proof… but I have a couple of questions, please. What is the advantage of the pro-biotic capsule? If we used say vegan yogurt with live cultures, would that do the job in a similar way? Is there really no salt, or lemon juice as additional flavour? Would that impact the fermentation process? Thanks so much! As a 12+ year vegan, but recently transplanted to Europe, I’m missing easy access to vegan options and am learning to make my own! Hello there. The advantage, for me, was knowing that I was using a safe and reliable source of bacteria. I don’t see why using yogurt as your source wouldn’t work, you just might have to adjust the time based upon which flavor you were after [longer ferment = tangier flavor]. You could certainly salt it. If I were to salt it, I’d do it afterward after tasting the product to see whether or not it actually needs seasoning. I got it to the draining process, and it’s been draining all day long, with a weight on top and everything… it’s creamy and tasty, but it’s still really loose and liquidy. Have I done something wrong? Did I puree it too much? There is no way this will hold its shape like in your picture – in fact I just popped it in a dish in the oven at 200 to try to dehydrate it more, because if I put it on some plastic wrap right now it would run all over the counter! It’s absolutely edible, it’s just more of a sauce than a cheese right now… would love some advice for the next attempt! Have you chilled it? After being in the refrigerator, mine set up nicely. Yet, from what you’re saying about it’s consistency, I think it’s unlikely that will happen. It’s possible that your cheesecloth has gotten clogged and isn’t draining the slurry well enough? If you’re having this issue, perhaps starting with either: 1) slightly larger meshed cheesecloth, 2) less liquid to begin with might be a better route for you, or 3) perhaps leaving the slurry with a little more texture and then draining it would likely be easier. I hope this helps. Thanks for the advice, D! Is there a particular reason you use raw instead of roasted cashews? Does roasting impact the fermentation process, or is it more of a taste preference?